Are SMBs Prepared for Disaster? According to Symantec’s 2011 SMB Disaster Preparedness Survey report, the findings show that though SMBs are at risk, they are still not making disaster preparedness a priority until they experience a disaster or data loss. Half of the respondents do not have a plan in place, even though 65 percent of respondents live in regions susceptible to natural disasters. The data also reveals that the cost of not being prepared is high, putting an SMB at risk of going out of business. The median cost of downtime for an SMB is $12,500 per day. According to the survey, downtime not only costs SMBs several thousands of dollars, it also causes their customers to leave. Fifty-four percent of SMB customer respondents reported they have switched SMB vendors due to unreliable computing systems. 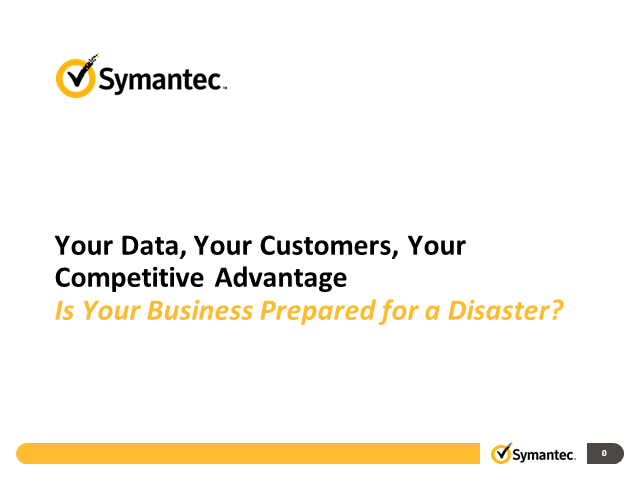 Symantec’s Monica Girolami will discuss the findings from the Symantec 2011 SMB Disaster Preparedness Survey report, and share tips for small businesses to follow when pulling together a disaster preparedness plan. Title: Are SMBs Prepared for Disaster?